The Charitable Choice provision and the Bush Administration’s National Faith-Based Initiative have broadened the scope of social services delivered through faith-based organizations. There are expectations that these faith-based social service providers will be more effective—but how should that effectiveness be measured? Faith-Based Social Services: Measures, Assessments, and Effectiveness explains the nature and quality of religion-based social service delivery while serving as a point of reference for future research and work. This unique source tackles the important, complex issue of measuring the effectiveness of faith-based social services in comparison to secular services while providing analysis of the latest available studies. 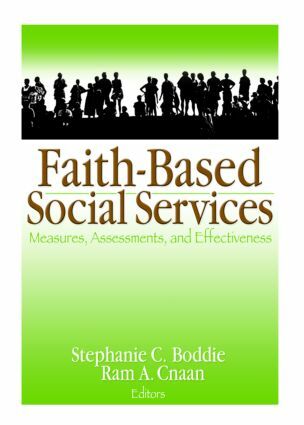 Faith-Based Social Services: Measures, Assessments, and Effectiveness provides a conceptual analysis of FBOs (faith-based organizations) that reflects the need to gather detailed studies to assess social service effectiveness while reviewing the crucial issues challenging public policy. The latest empirical research is detailed, including the problems found when comparing secular and faith-based social service providers, their organizational structures, and the types of services offered. Analysis is included of the data from a three-state evaluation of welfare to work programs, a study of four types of faith-based services found in four cities, and an assessment of a church-based program for teenage drop-outs. Faith-Based Social Services: Measures, Assessments, and Effectiveness is illuminating reading, perfect for social work professionals, students, educators, sociologists, religious leaders, and seminary educators.